UPDATE: This was originally a 23 channel list, but since then I’ve added 5 more. You may want to bookmark this page, since I’ll probably keep adding more channels over time. I have a new binge-watching habit. But it’s not on Netflix. No, it’s weirder than that: it’s YouTube video essays. If you haven’t spent much time in this sector of YouTube, here’s how a video essay usually works: an expert (or a superfan) uses a mix of video, animation, infographics, academia, and humor to explain a complicated subject in simple terms. Think of them as mini-lectures, delivered in a bite-sized format you’ll actually want to finish. While there’s usually just one voice or presenter onscreen, these channels are often made possible by a small team of collaborative researchers, editors, designers, and animators. (And, if they get popular enough, sponsors.) So, in essence, each video essay is a (usually) brief episode in a loosely-related series on a topic, made either by one artist or by a branded team with a shared vision. What Does It Take to Make a Great Video Essay? Each of the following channels excels in at least one of these areas, and often in all five. They’re also fantastic examples of how to structure a headline hook that attracts attention and then holds it throughout the length of the video. 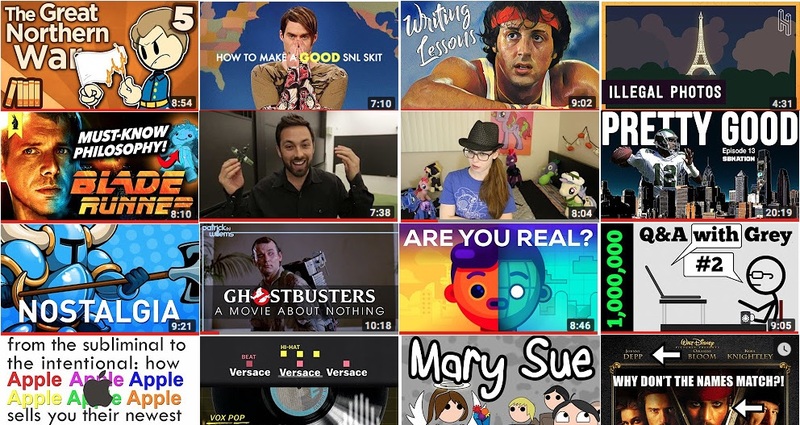 Not only will these channels teach you something you didn’t know, but they’ll do it in a way you’re more likely to connect with, enjoy, remember, and want to share with others. Channel Focus: Half weird pop culture, half media analysis. Why Do I Dig It? Laid-back delivery, low-key comedy timing, and detailed dives into media I wouldn’t have explored otherwise — like the underground world of China’s bootleg Star Wars comics. Channel Focus: Explaining the pros and cons of TV and film language. Why Do I Dig It? Every video feels like a short film school lesson. Channel Focus: Politics, history, and weird quirks of math and science. Why Do I Dig It? He’s a poster boy for how to make data interesting. Channel Focus: Deconstructing modern life and digital trends. Why Do I Dig It? Great quick examples of how to frame and support an argument. Channel Focus: Deep dives into the styles and trends that shaped the history of film. Why Do I Dig It? Every video is like a slightly longer film school lesson. Channel Focus: It varies. I found them through their fantastic series of historical explainer videos, but they also explore video games, psychology, and more. Why Do I Dig It? Two reasons. First, they make history lively by structuring their videos as narratives about their subjects’ needs and desires. Second, their innovative use of universally cute icons to represent various historical figures has an unusual effect: it humanizes everyone equally, which allows the audience to invest themselves emotionally in all sides. Channel Focus: Examines what makes a scene, moment, or entire film work… or why it goes wrong. Why Do I Dig It? Uses popular films to examine the power of specific storytelling tropes. Channel Focus: Weird and obscure trivia about history and geography. Why Do I Dig It? Quirky content, briefly well-explained. Channel Focus: Analyzes writing and storytelling from a structural perspective: what’s the best way to convey information, and how do cultural tropes affect the way we process stories? Channel Focus: Close looks at the intangible aspects of storytelling, like editing, soundtracks, laugh tracks, and other aesthetic choices that change how we process the onscreen information. Why Do I Dig It? Clear explanations plus high-quality production values. Channel Focus: Deep deconstructions of Game of Thrones, Westworld, and more. Channel Focus: “Tough love” writing advice from a self-published author. Channel Focus: Deconstructing the downside of your favorite pop culture tropes. Why Do I Dig It? Jenny’s no-budget aesthetic and disarming delivery is deceptively sharp and consistently dry, and her analysis of why most films are broken is deadly accurate. Channel Focus: Weird facts and sports trivia, brought to life by (purposely) bad infographics. Why Do I Dig It? Every video Jon creates is a work of 8-bit art with a nugget about the truth of the human condition buried inside. Channel Focus: Analyzing films and TV to find out why some stories work and some don’t. Why Do I Dig It? Channel creator Sage Hyden digs deep into story structure to explain how the format of our media affects the kinds of stories we tell. For example, this video will change the way you think about animated movies. Channel Focus: High-level overviews of huge pop culture topics. Channel Focus: Analyzing story structure in film and TV. Why Do I Dig It? Runquist exposes narrative tricks hiding in plain sight — like during the first few minutes of Stranger Things — in such a way that you suddenly feel like you knew them all along. Channel Focus: Explaining how life works, both literally and figuratively. Why Do I Dig It? Possibly the best union of animation and narration on YouTube. Plus, they make super-complex subjects infinitely easier to understand. Channel Focus: Comparing finished films to their screenplays to find the building blocks that help good scripts become great movies. Why Do I Dig It? Each video explains a core storytelling technique through visual examples that make what could be dry theories into easily-remembered demonstrations. Channel Focus: Cynically exploding the problematic tropes of pop culture. Why Do I Dig It? Every video is like a dyspeptic film school lesson. Channel Focus: Explaining how video games work via examples of good and bad game design. Why Do I Dig It? When you’re playing a video game, you rarely have time to stop and appreciate how it was built. Every video Mark adds to his Game Maker’s Toolkit series helps you appreciate the multiple systems and creators at work behind the interactive experiences we often take for granted. Channel Focus: Irony-drenched movie analysis that’s almost as long as the movies themselves. Why Do I Dig It? Deep, smart, wry deconstructions that pull no punches. Channel Focus: Functional film analysis, sometimes on a shot-by-shot basis. Why Do I Dig It? Willems is an aspiring director who treats every essay like it’s his own short film. Channel Focus: Love, relationships, and identity. Why Do I Dig It? Blunt advice, delivered by often beautiful and always emotionally evocative animation. Channel Focus: Storytelling flaws, cheap stereotypes, overused ideas, and bad writing habits. Why Do I Dig It? The writing “advice” is good, but the details embedded in the animations are even better. Channel Focus: The oddities of science, math, and statistics. Why Do I Dig It? Simple explanations of scientific laws and theories, often with easy-to-remember examples. Channel Focus: Vox Media’s subset of videos that focus on the art, science, and business of pop music. Why Do I Dig It? Part history lesson and part musicology course, host Estelle Caswell explains how musical trends work using anecdotes and visual aids. Channel Focus: Pop culture meets philosophy. Why Do I Dig It? In addition to being one of the highest-quality video essay channels on YouTube, every Wisecrack video analyzes a piece of pop culture from multiple angles — artistically, sociologically, philosophically, and more. I study a lot of film and media, so my list of the best YouTube channels is obviously biased in that direction. Also, I’m frustrated to note that my list is mostly made up of white guys, which highlights of the apparent lack of diversity in the video essay field. I’d like to expand this list in both directions, and you can help me out. So, if you (or someone you dig) are doing great video essays on other topics or from other perspectives, I’d love to see what you’re working on. Tweet me or leave a comment below so others can see what you’re up to! Want More Posts About Storytelling? What Makes Game of Thrones So Addictive? Regardless, thanks for creating this list. Means a lot. Can’t wait to devour the various channels that are now new additions to my subscriptions. Love from India! 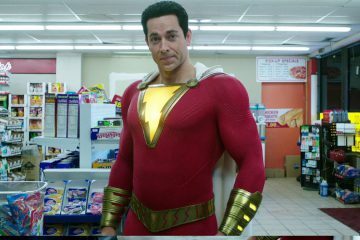 A hero is only as good as his villain, and that's where Shazam's plot problems start. 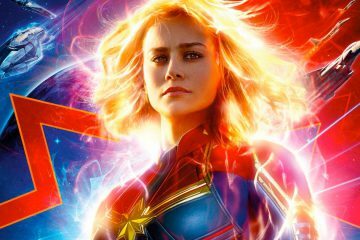 Captain Marvel offers a smart answer to a hard storytelling question: how do you make a compelling movie about the world's strongest hero?